If you travel alone or with young backpackers, I recommend this hostel. It was easy to get to Mauritania hostel from bus station by foot,around 20 minutes and you can find hostel sign on the way. Nearby restaurants and there are lot of shops. We found a nice and cheap local restaurant. Hostel staff were really nice and kind. There were toilet paper,WIFI(not so strong though) and HOT WATER. Every day house keeper cleaned accommodation. Hostel had nice terrace. the location is very good, recommended if you don't mind shared toilet/bathroom. Great and cheap place! It's very clean, quiet and has a beautiful rooftop terrace. Very nice setting in the common areas and well located place. You feel the moroccan culture.. Great location near the plaza.. Basic hostel/hotel, good location. Helpful staff. 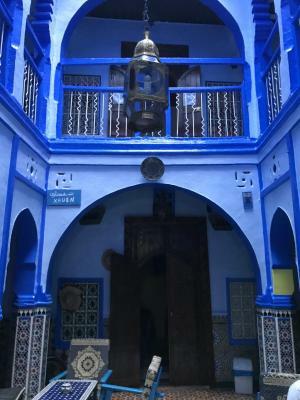 The best thing about this hostel was the location because it’s very near the center of the medina, so it was easy to get around by walking. 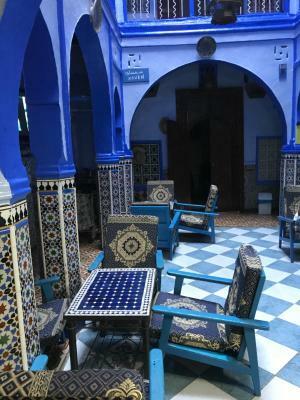 Featuring free WiFi and a sun terrace, Hostel Mauritania offers accommodations in Chefchaouene. Every room comes with a shared bathroom fitted with a shower. Outa El Hammam Square is 350 feet from Hostel Mauritania, while Kasba is 650 feet away. The nearest airport is Sania Ramel Airport, 29 mi from Hostel Mauritania. 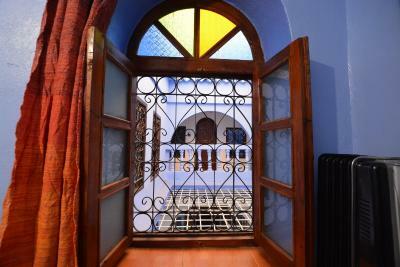 뀐 Located in the top-rated area in Chefchaouen, this property has an excellent location score of 9.1! 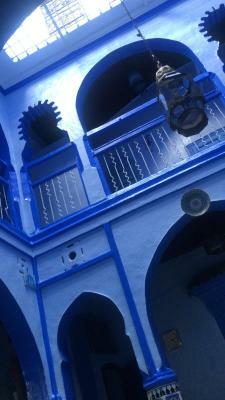 When would you like to stay at Hostel Mauritania? This double room has a tea/coffee maker, dining area and kitchenette. This quadruple room has a tea/coffee maker, dining area and kitchenette. House Rules Hostel Mauritania takes special requests – add in the next step! Please note that this property does not accept bookings from non-married couples. A valid marriage certificate will be requested at the check in. The guests were nice at the hostal. Had a bit of trouble with the hot water - might be used already by some of the other guests before us. 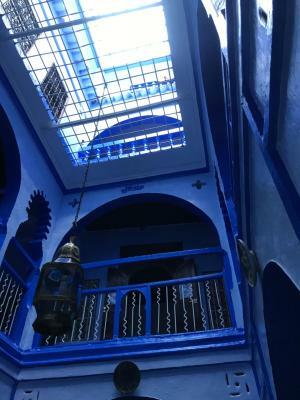 Be aware that the riads have open space on the top, so it can be colder/windy in the winter months or during the night as its a mountainy area. But for sleeping was alright as there were plenty of blankets provided. Easy to find - around 15min walking distance from the CTM bus station; 1 min away from the main square. We could order breakfast/tea for paying a bit extra. Lovely view from the top of the riad. If you travel with old persons, I don't recommend this hostel because it is located far from the main road. Cold, dark and dingy. Our room smelt like stale cigarette smoke. The staff were not particularly friendly. Toilet is on a different floor to our bedroom. The building is noisy and echoey and gets a lot of street noise. The facilities list a kitchen. The 'kitchen' is a tiny box outside the hostel in a neighbouring building with barely any utensils or equipment- we gave up on cooking and decided to eat out. 2 hotel guests were very noisy during the day shouting from ground to the third floor and to the staff. I asked the staff if they are always noisy like that and he said no. Guess what? These 2 South Asians from UK were shouting again at night. I have to rise my voice from my room to at them shout out. I guessed this didn't matter as the staff had not kept his word. Second night, the staff and his friends were watching program from phone. It was noisy but I guessed it didn't matter as the noise outside the window (the street) was even louder. It was about 10 pm and I thought there might be a bar close to it. The noise kept going until 1 pm. I went down stair to ask the guy still watching video on phone to change my room or got the people outside to keep quiet. He informed that the staff was sleeping in one of the rooms and said (more in body language) to keep the people outside quiet. It was almost 3 am and the noise was still on. I opened my window to shout outside to keep quiet. The noise was since lower down a lot until 4 am. I had to wake up at 5:15 am to catch my 7-am only bus to Rabat. The bus ticket spelt out that I must be there at 6:30 am. Other than this disappointment of not having a decent sleep, the staff are okay with directions. I left my soap in my previous hotel and it was too late to buy one. The staff shared the body wash and I think it was nice. The UK Guests were hanging loudly for room price reduction for an additional night and then they also borrowed kettle. The staff agreed to everything. But I didn't understand why he allowed them to shout!? Nice terrace. Doorman had good English and was helpful. The stuff was extremely cold and quite difficult to find when we need it. The terrace is pretty nice, with a wide view of the city. Unfortunately during our stay the kitchen was under construction. At our check in we were told that there would be breakfast. But in the next morning somebody told us that there woudn t be one. The location is perfect in the City Center. Nicley decorated hotel, our room and the bathroom was clean. Amazing rooftop! Cold room and pretty small. Quiet as winter time. Nice hostel keeping in with blue theme of the town. Easy to find, good location., Friendly staff. The facilities are not very comfortable.The room is cold in the night. The location was so good and it has a lovely terrace for spending good time. Inside was cold. Our room was strong tabako's smell.